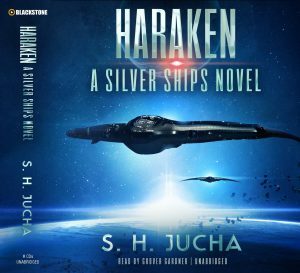 I’m happy to announce that, as of July 12th, the “Haraken” audiobook is now available in an MP3 version on Amazon. The CD version of the audiobook will be available in a few days more on Amazon, Audible, Blackstone’s site, and Blackstone’s third-party distributors. This represents the fourth audiobook available for the Silver Ships series. I’m in the process of setting up a contract to ensure that “Sol” is also distributed in audio formats. This entry was posted in Readers, Uncategorized on July 12, 2016 by Scott Jucha. “Sol” #1 – Thanks readers! Days after “Sol” was released it hit #1 in two categories and #2 in a third category, boosted by the book’s advanced orders. While the position at the top of Amazon’s rankings is short-lived, it’s a delight to be appreciated by my loyal readers. This entry was posted in Readers, Uncategorized on July 10, 2016 by Scott Jucha.